• How long do we actually walk? The itinerary is yours! However, several aspects of the game will help you decide which direction to take for the next step of your investigation. Most of the participants walk between 5 and 6 km during the game and pass by most of Cholon landmarks as well as authentic herbalist shops and hidden gems. • During the game, do I have time to visit or should I run against the clock? There are 2 levels to “The strange case of Dr Lam” scenario. People willing to take their time and explore Cholon at their own pace will be able to finish the main narrative line of the game before lunch. Participants willing to solve the entire mystery will still have time to visit colorful pagodas, authentic herbalist shops and other hidden gems of the Chinese quarter but will also need to better analyse the clues and take quicker decisions. Most participants finish the first part of the game and enjoy a memorable time in Cholon. About 20% of the participants are able to unveil the full plot. it is up to you! • Can I join Urban Tales with my children? Children over 12 years old are considered as adults and will be able to enjoy every features of this original walking tour. Children under 12 years old are welcome under an adult supervision and will benefit from a discounted price. Children under 7 years old are free of charge. We provide a cyclo for them quite early in the game so they can follow without any problem. • I heard that Cholon is a very crowded area of HCMC, is it safe to walk by myself? 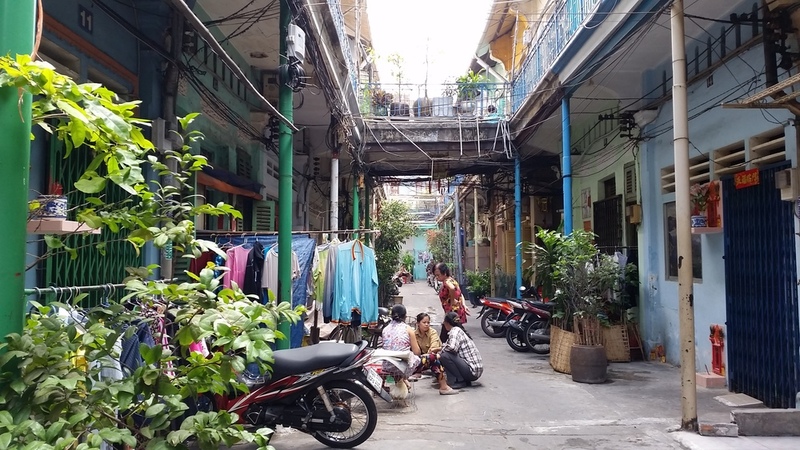 Cholon is indeed a very crowded area of Ho Chi Minh City, that is why we decided to set up Urban Tales in the morning, when the streets are quieter. Walking in Vietnam is a challenge for most Westerners but Cholon is not different than any other place for that regard. By carefully looking both sides of the street before crossing and by following the sidewalks, exploring Cholon becomes very agreeable. • I would like to privatize urban Tales for a private event, is it possible? Urban Tales can accommodate about 15 participants at the same time. Please feel free to let us know should you wish to privatise. We offer deals! • If I come with a friend, are we going to be teamed up with other participants? No. You would meet other participants at Dr Lam’s apartment and for lunch but you will never be teamed up with other participants during the walking tour. • Does Urban Tales require the participants to play a role ? Feel free to play your role and start thinking like an investigator! However, the game was designed for everyone to be able to join it. It does not require any role play or acting skills. The actors that you will encounter during the game will be playing a role and are trained to react according to your questions and level of confidence. If they see that you play a role, they will probably enjoy it very much. If they see you are simply enjoying an original walking tour, they will interact with you and help you as much as they can.